It’s safe to say that no matter where you work regardless of the industry or profession you will encounter the inner dynamics of people plotting and scheming and jockeying for position and power… something called office or workplace politics. Workers have three options when faced with a politically charged workforce: disavow that politics actually exists; decide to ignore the political landscape; choose to work within the system. In reality, the first two options have the same (often negative) consequences, while the third can provide you with insight and success. This article is about providing you with strategic tips for understanding and maximizing the political landscape of your organization helping you avoid dangerous landmines while working within the system to your benefit. Tip 1: Observe the Current Power Structure. Within any organization there are two types of people with power: people who have formal power based on their position (such as your manager) and people who have informal power based on performance (such as the salesperson who handles most important client). In some cases, there is a third type of power person someone with such charisma that people naturally like and support. Power positions are not static, so you should regularly observe the dynamics within your workplace and make note of the people with the power. Because people with power have followers, you’ll also want to observe which “camps” your co-workers fall into. Tip 2: Avoid Ever Crossing a Person With Power. It’s just as dangerous to challenge or dispute someone who has a high degree of informal power as to do so with your boss. That’s not to say you can’t or shouldn’t try to stop someone with power from making a decision that will negatively affect the organization. Instead, when you genuinely feel someone in power is hurting the organization, you may have to build alliances and eventually get someone with more power to understand the problem and let him/her deal with it. Tip 3: Bridge the Gaps Between/Among Power Groups. When possible, it’s best not to be identified as belonging to one power group over any other mainly because if that leader of that group falls from power, you’ll lose by association. Instead, you can showcase your skills and abilities by associating with more than one of the power bases within your workplace. The key is to perform your job to the best of your abilities while providing assistance to the people in power. 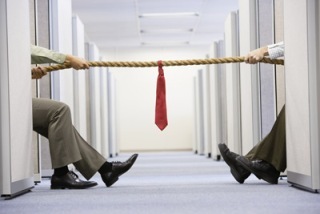 Tip 4: Understand Potential Tensions With Your Co-Workers. Workplace politics can get a bit ugly when resources are scarce, thus a friendly co-worker to your face could be plotting against you behind your back. Remember too, that all the workers at your same level or position within the organization are jockeying (to some degree) for the limited promotions to the next level. Thus, always try to maintain good working relationships with your co-workers, but remember to strategically guard your ambitions and strategies for advancement while protecting yourself from possible attacks. Tip 5: Use Workplace Politics to Your Advantage. Office politics is often associated with negativity, but you can use the political landscape of your workplace to your advantage — for promotions, funding of pet projects, and even helping co-workers achieve greater success. The first step is to always volunteer to complete additional tasks or assignments for someone who has power, thus showcasing your abilities while winning favor and earning “points” for going above and beyond. Then, when you feel you deserve a raise or need a favor, you can cash in those points for their support. Tip 6: Never Use Your Power Unless You Truly Need To. If you are lucky enough to be someone who gains power in your workplace, your strategy should be to never actually use it. It sounds odd, but the threat of power is always greater than the actual use of it. Once you use your power for something, you actually lose a great deal of it and must start amassing it again. Office and workplace politics is often seen as something that negatively affects people within the organization and while that can be the case when someone abuses his or her power — politics can also be beneficial. The more you understand the political landscape of your organization who has the power and which co-workers are in which political camps, the better you can minimize the negative consequences while maximizing the positive benefits. Using the tips in this article should help you do so. Finally, for those of you not totally convinced… Have you ever wondered why someone who was not technically or professionally qualified got promoted over others who were? The simple answer is workplace politics. More times than not, obtaining a promotion or pushing forward an agenda comes from strategically using workplace politics to your advantage. V. Useful tips. Also briefly speaks about the various kinds of office politics. The author guided well to use this politics. But this tips aren't enough. More real time tips with few examples might have made this post the most interesting one.Kay…..
As someone who has recently resigned their managerial post (due largely to a subordinate who played the politics game so well they ended up leeching my job from underneath my feet), the subject of this post is one I can definitely identify with. Unfortunately, I have read this far too late to prevent the chain of events that unfolded. I have had to notch the past month up to experience and enforce my new motto of "Dust off – move on".Thanks for the insight.